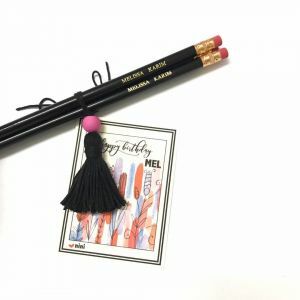 Set of 3 flat personalized note cards, lined envelopes and pencils with a modern calligraphy design personalized with your name. Personalize your stationery set and make it uniquely your own! Cards are flat printed on thick white card uncoated 4x6 300gm heavyweight paper. Set comes wrapped with ribbon, perfect stationery to display on your desk or ready for gift giving! Birthday gift, graduation gift, Christmas gift or just a set to have for your own. *tag on paper bag shown in the last photo is not included unless requested. 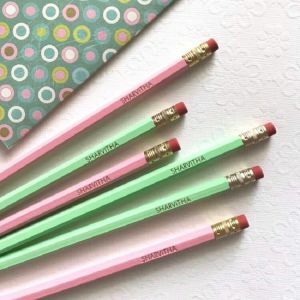 This product is dispatched to you by the Funky Pencils. Please refer to product details for time needed to make this product.